You’ve got a logo. You’ve decided on a brand archetype and your website is up and running. Now you’re ready to start putting together some ad campaigns to help bring customers to you. Where do you even start? The answer is always with your customers. But not just any customers. Your ideal customers. The ones who will use your product the most, come back for more, and sing your praises on the web. These are the people you want to advertise to. Every word you write needs to be focused on bridging the gap between these customers and your products. Once you figure out who your ideal customers are, pay close attention. Follow them on social media and learn what matters most to them. Pay attention not just to what they say, but how they say it. This will help you find the right words when writing copy. It can also help you choose good SEO keywords to use in your online copy to boost your search engine rankings. Remember back in school when your teachers assigned essays? When you were first learning to write papers, your teachers required you to turn in more than just a finished product. You had to turn in a thesis and an outline first, right? The reason for that was to make sure that while you were writing that essay, you knew exactly where you were headed and how each paragraph fit into your overall argument. It’s the same with writing effective ad copy. Don’t just write ads to fill up your social media page or your local paper. Write ads that build upon one another to create an overall campaign. Keeping the big picture in sight will not only help you decide which words to put to paper, but will ensure your branding stays consistent over time. 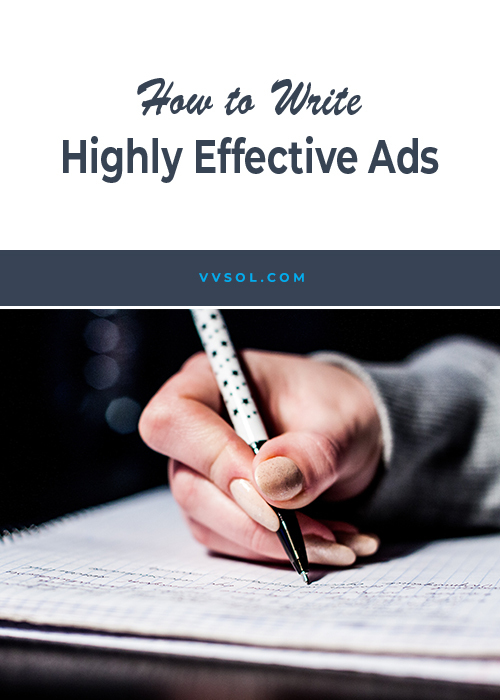 It also takes the pressure off you for writing the perfect ad. Because it’s not just about a single ad. It’s about accomplishing the clearly-laid-out goal of the entire campaign, one ad at a time. Are you sick and tired of wasting money on Facebook ads? Are you ready for Facebook ad solutions that works. We offer social media management and ad creation. Click here to learn more about our plans.